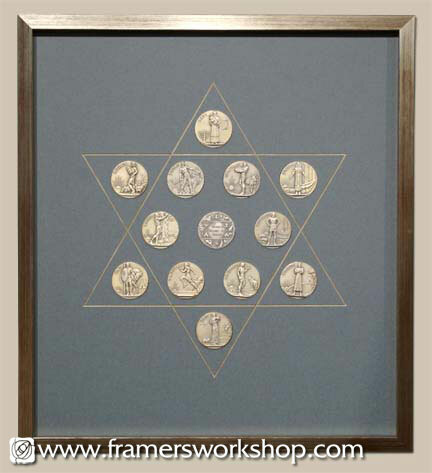 These beautiful coins were each placed in a small circle cut into a precovered silk mat. Using our computerized mat cutter, we then cut and hand-colored a V-groove to enclose the coins in the shape of The Star of David. The project was glazed with ultraviolet protecting glass with spacers to create a small shadow box and protect the coins. Frame by Genuine Gold and Burl..